Modern Mongolia consists of 21 provinces (aymag, aĭmag) and capital city. Second level of administrative division - 372 "soms" (districts). In these photos: http://2.bp.blogspot.com/... from http://markandkaraestep.blogspot.gr/, http://www.miniih.com/... from the aymag's local legislature site and http://www.meri.mn/fil e/arkhangai/img_1244.jpg we get a light blue flag with the centerpiece from the new emblem in yellow close to the hoist. 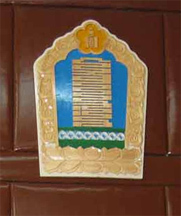 Provincial emblem in the cabinet of official. 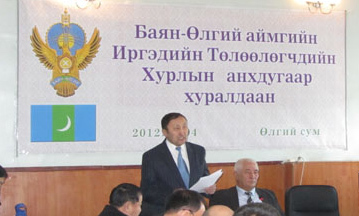 Also Arhangay aymag seems to have changed once again its symbols as we can see in the FB page of the aymag's governor and in this photo: http://arkhangai-ith.com/... from the local legislature's official web page.. The new flag is blue with the new logo: http://arkhangai.gov.mn/ ...png from the official aymag govt web site. The emblem seems to be closer to the hoist. In this photo the flag seems so long and the emblem off-center. I think this emblem is placed in the center of the flag, at least based on this image taken in front of Mongolian Civil Defence building: (http: //nema.ar.gov.mn/...). Possibly there could be both variantions, one for indoor usage when emblem ia placed near to hoist, and another one for outdoor version when emblem is centered. Light blue with the province emblem (diam. : ~=2/3 height) on the center. Approx. ratio: 4:7 The emblem shows an elephant on a (lighter) blye sjy backgrouns, with white clouds, standing on a setting sun (? ); the elephant is saddled and on its back there is a column held by charyatyd-like figures and on its top rests a light blue globe with the national emblem, which extends onto the circular border of the emblem, which is black with white "egyptian"-maze ornament. Elephant and column are gray. Onother image made after photos made in Mongolia. The emblem shows an orange round ornament, made of four leaf-like shapes and 12 vertical lines, above the the word "Булган" in yellow cyrillic capitals, all enclosed in a circular wreath made of two stylized wheat ears, closed by an orange flame (like the one on the national arms). In the site of Orhon aymag's local legislature: there's the image of a flag that seems to be that of the aymag: Below the image there's a decision of the local legislature dated 2001 that probably contains a description of the aymag flag. Very dark blue flag with a golden emblem on the center and a narrow vertical stripe near the fly. The emblem consists of two rings (approx. the same width than the said vertical stripe) each with four tangent discs (diam. approx. double width than the said mentioned measure) attached at top, bottom, left and right; the discs overlapping side by side in such a way that the center of each is covered by one of the lateral tangent discs of the other, being this the discs aligned in a regular pattern 2+4+2; over all a flame apparently identical to the one in the national flag (q.v.). This device features also in the provincial emblem. Flag ratio approx. 4:7. According photos made in Mongolia the narrow vertical stripe placed near the hoist. I received of Marek Bocianski a photo with this adress http://gate1.pmis.gov.mn/dundgobi/ showing the new flag of the province of Dundgovi. The dinosaur emblem :http://i46.tinypic.com/15nlr7l.jpg of the Dornogovi aymag's flag has been "redrawn": http://i51.tinypic.com/6p16pw.jpg both from :http://www.sa inshand.miniih.com/index.php/home/post/384. I believe this change to a more stylized version of the dino emblem was made last year to commemorate the 80th anniversary of the aymag's establishment. And here's :http://dornogobi-ith.gov.mn/index.php?option= com_content&view=article&id=275:a\ &catid=1:latest-news from the aymag's local legislature web site the flag with the new emblem. Former flag of Dornogovi province. Vertical triband green - very dark blue - green with stylized landscape countour on the top part of the central panel, showing three mountain peaks (middle one in foreground), sun (?) and moon (? ); mountains void, sun red and moon white, all bordered golden. This is also the background of the provincial and prov. capital's official emblem. Middle stripe slightly wider, flag ratio approx. 4:7. New COA of the Govi-Altay Aimag (2011) from official website. The Hovsgol aymag flag shows an outline of the namesake lake (see it i.a. at http://upload.wikimedia.org/wikipedia/commons/2/25/Mongolia_1996_CIA _map.jpg) I suppose the anchor stands for lake shipping; both Hatgal and Turta seem to be harbour towns. Here is the new flag of Khuvsgul Province in Mongolia - http://www.khuvsgul.gov.mn/? page_id=1280. But they "fail" to show the change in the symbols' chapter of the govt site. While the artwork on Facebook shows the stars as metal, with light falling on them from dexter, I'd say they're really supposed to be white. The Selenge aymag flag shows waves, I suppose, for the namesake river, one of the Baykal tributaries, that crosses its territory. The emblem consists of a dark blue square with a light brown pegausus with yellow, orange and light blue wings on it, surrounded by a wide red border with the white letters (serif capitals, for those in Cyrillic script) making the words "Сyхбаатар" (top), аймаг"; mongol orthography texts (left and right) -- which mean "Sụqbaatar province" in Mongol -- written respectively in its Cyrillic and Mongol orthographies (quite suitable, as Mongol script runs vertically from top to bottom and Cyrillic horizontally from left to right). This square sits on yellow and white flower-like device, also vert. and horiz. symmetrical, which in turn sits on a equally symmetrical green light-blue-fimbriated leave like octogon. Dark green flag with white-fimbriated orange stripe near the bottom; over it, set to the hoist, white and orange ornament. Flag ratio approx. 4:7.